Okay, okay, so just one more teensy weensy post about Christmas and then I'll give it a rest for a little while. I realize that some people are a bit more...ahem...Scroogealicious or Grinchtastic when it comes to Christmas. However, I, am not one of said people. Over the years I've made it a fairly big deal to have pretty trees. 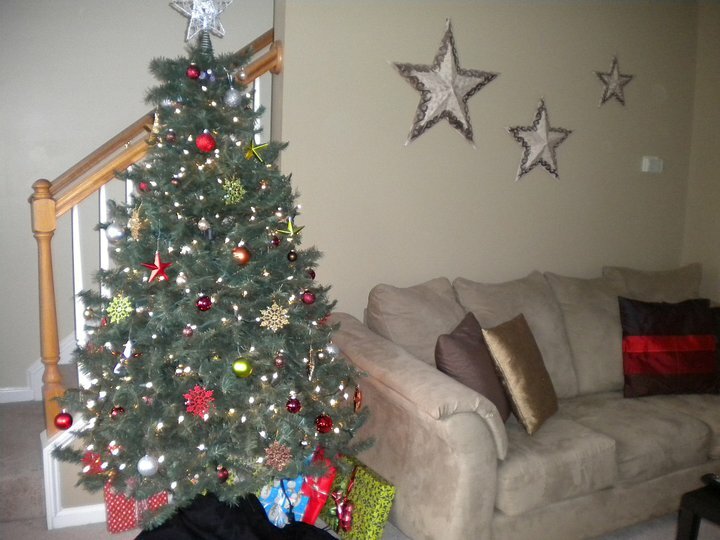 Some years I've tried to have some sort of a color scheme or an ornament theme to each tree. However, that can get pretty expensive. So, I've amassed a collection of ornaments in EVERY color and either match the trees to my decor that year or just do it in whatever color combinations I'm currently digging. I'm always on the lookout for pretty Christmas tree pictures for inspiration too! So, there! That's your charge! Take a pic (a cellphone pic or a regular pic will work...I can resize and edit it if needed) of your tree and email it to me at aprilanne147 [at] hotmail [dot] com and next Tuesday I'll post my 5 faves. The top pick gets the prize! Contest is open until next Monday, December 5th at 6:00 pm EST. To whet your Christmas tree appetite, here are a few of my past years' trees.